Lion Ark is built entirely from live action with commentary and reaction from the participants as events actually unfold. Lion Ark Director Tim Phillips describes the painstaking process of constructing the complex narrative. We knew that this operation could be historic because no one had attempted anything on this scale before – clear an entire country of animals in circuses in one go. The circuses were spread all over this beautiful, remote country – about the size of Texas and California combined – and none of them was willing to give up their animals. There were so many animals and 25 of these were lions. There was no infrastructure to do this – there wasn’t a sanctuary or animal hospital to work out of, we’d have to build what we needed as we went along. So if it came off – and that was a big “if” – this was going to be a document of a remarkable piece of history. So my first thought was record everything – the planning, the seizures, when things went wrong, when things went well, everything. We shot primarily on Red with a Cannon 5D and made the location filming our biggest commitment. We had Mark Whatmore as Director of Photography and Tony Pattinson filming for over five weeks in Bolivia, so we have an incredibly rich visual record of these events. 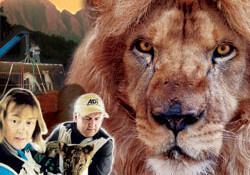 In Colorado when the Lion Ark landed we had even more cameras. On top of the filming were additional audio sources, radio mics, surround sound mics etc., so we built up a huge audio record of the operation. It was this commitment to getting the raw materials that makes Lion Ark such a vivid document and as the operation unfolded we realised that we had something really, really special. I’d made documentaries before where the participants look back over the events that are central to the story. What we wanted to do with Lion Ark was have everything taking place as the story unfolded, have any interviews and personal commentary in the context of the story. So when Jan Creamer (President of ADI) is talking about the confinement these animals endure and the resulting problems, she is eye to eye with a lioness she is rescuing. As she describes stereotypic behaviour, that lioness is repeatedly pacing in the cage in front of her. Inevitably, this has a different feel to something recorded after the event. We also wanted to ensure that people stayed in the moment, giving the film the momentum of a drama, led by the events and action. We didn’t want to cut from vet Mel Richardson battling in sweltering heat and semi darkness to save an animal, to him six months later explaining what happened so we had to get live commentary and reaction as it happened. Those reactions to events as they occur give a real insight into the protagonists in the film – there is additional passion, immediacy and even intimacy. Where we did have to give background information, for example when the team are talking about the undercover investigation that led to Bolivia’s ban, we filmed in a small bar in Santa Cruz. The team sharing a beer, talking about their exploits, and what led them here. This is not just in keeping with and maintaining the context of the film, but it also better captures the gritty side of undercover work. However, the majority of action in Lion Ark is constructed not from interviews but from the actual conversations and events that took place. That is what presented the greatest editorial challenge, building those conversations and narratives to events from disparate sound sources. We established what the key events were and we began building these scenes out of all the available recordings. These would be the building blocks of the film, scenes you could follow with no explanation – as if you were standing there watching the events unfold. This meant painstakingly transcribing the available material, getting translations of the Spanish, and then cutting this together to form dialogue. By the end of this process, all our live action building blocks lasted a huge 250 minutes. That’s when the process of turning it into the film as it now stands really began. We inevitably lost some very dramatic scenes as we streamlined the film and created an interesting narrative, for example allowing different seizure to bring out different aspects of the story, removing repetition, keeping the action moving and fluid. As we near completion Lion Ark runs at under 100 minutes which shows how this raw narrative has been distilled down. Also, as a drama, the story unfolded perfectly. Eight different circuses were raided in Bolivia and one elderly lion was removed from a zoo and each represented a different challenge a different type of drama. Just when you felt things were going the way of the rescue team there would be a setback or other dramatic turn of events. If you had been scripting fiction you would have been building up the tension or providing the twists and turns just where they actually occurred. Obviously, it would have been easier to put this together with a standard narration, but that could never have captured the truly visceral experience of this rescue operation, nor taken the viewer to the very heart of this remarkable adventure. It’s been a painstaking process but worth it.